You don't have to settle for the tops on store racks. The Comfy Drape Top is an easy way to learn how to make your own clothes. It's a great project for those who are learning how to sew using a pattern. 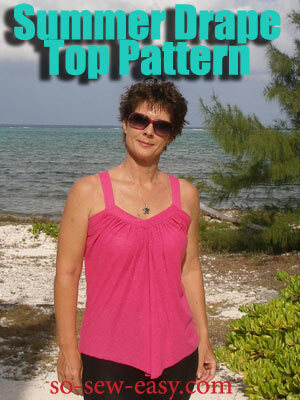 This sewing tutorial will leave you with a sleek top that will make heads turn. You'll love the feel of the soft knit fabric. This top can be made using any choice of fabric, so you can even make a few. It's also a great project to make gifts for friends. Great for a beach cover up too, over a bikini top.